“You could not design better ecological conditions for diversity. Groton has one of the most complex geologic systems anywhere,” said geotechnical engineer and GCT Trustee Bob Pine when he spoke at the Connecting Communities Along Our Trails 2015 event, Sunday, May 31 at the Groton Town Hall. 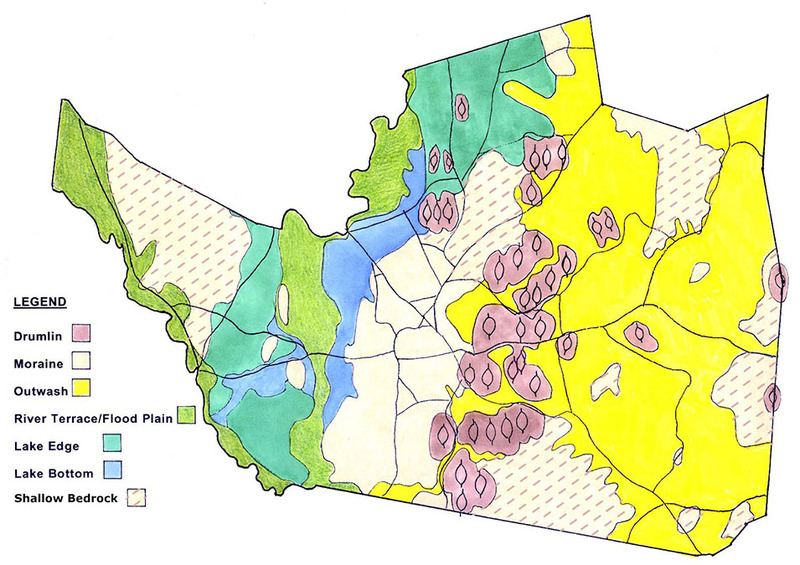 This map, drawn by Bob Pine, shows the diversity of glacial landforms in Groton which has led to a bounty of ecological diversity. The purple “swarm of drumlins” is an unusual occurrence, with two of the best examples here and the Boston Harbor Islands. Pine outlined the “Gifts of the Glaciers” features left behind in Groton by the Laurentide Ice Sheet as it melted and faded north, ending the Pleistocene Ice Age, which lasted 2.5 million years. The kames, eskers, kettle hole ponds, braided streams, and drumlins that mark the Groton landscape were fashioned 20-12,000 years ago, by the glacier as it picked up and deposited silt, soil, and rocks in its advance and retreat. Central Groton once held part of the 35 mile long Glacial Lake Nashua, which formed when huge walls of ice blocked the outflow. The original southerly flow of the more ancient Nashua River was reversed, causing it to flow north into the Merrimack. The sediments of this lake and the river deltas that flowed in for centuries provided some of the prime farmland for colonial settlers between the rivers. Other glacial features provided a diversity of soils. Drumlins were better for orchards. The river highway granted one of the greatest gifts of the glaciers. A wide range of streams was used for trade and communication. John Tinker established a trading post in 1658 near what is now the Petapawag Boat launch on the Nashua River. This area later became the site of many types of mills. But the land has a much longer human use. Archaeologist Mike Roberts explained how the diversity of landforms, topography, soils, and wetlands provided a variety of plants and animals. This made the Groton area an optimal hunting ground for early humans who followed the megafauna into the area about 12,000 years ago. As the glacier retreated north, the area developed even more biodiversity, and the native cultures developed more diverse hunting tools. Fishing became an important part of the Archaic diet. About 4,000 years ago, during the Woodlands Period, native cultures established homelands, with the use of bows and arrows, potteries, and farming. The biodiversity remains in the area. The state has designated 88% of Groton to be an Area of Critical Environmental Concern (ACEC.) BioMap2 identified 67% of the town as Core Habitat for the long-term preservation of rare species and diversity of natural communities. Groton has permanently protected more than one third of these areas. “We have a culture of conservation here,” said Bob Pine. Longtime environmental advocate, Marion Stoddart, who led successful efforts to clean up the Nashua River, stated there is still work to do to preserve and maintain wildlife habitats and corridors in the area. Earlier and later in the rainy day, tours of mountain bikers and hikers got a close-up view of Groton’s glacial gifts. The Groton Trails Committee maintains over 110 miles of trails for public use, and sponsors monthly walks. There are also 17 miles of river “blue trails” and several large ponds in the town. Connecting Communities Along Our Trails 2015 is a joint effort of the Montachusett Regional Trails Coalition and Freedom’s Way National Heritage Area, which sponsor a trails event in a different town every month. Events are planned for July in Leominster, August in Westford, and September in Templeton. This article was compiled by GCT advisory council member Mary Metzger.